Located north of Eau Claire, Anderson’s has been producing Wisconsin’s finest maple syrup for over 80 years. They are one of the largest maple syrup producers in Wisconsin. Extremely high quality and handmade by the owner himself, you won’t find a better maple syrup than this. In the Anderson tradition of offering pure and all-natural products, their 100% Natural Apple Syrup is made from fresh squeezed apples. This is a less expensive syrup because it contains only 25% pure maple syrup. The other 75% is white crystal sugar and water. This is a great alternative to the other syrup brands that have no, or less than 5%, maple syrup in them! Pure Maple Sugar is a very versatile product that tastes great with almost anything. Try it in your coffee or on fruits or cereals. It also makes great topping for meats and vegetables. All of Anderson's pure maple syrup is Grade A dark amber. It is not too strong and not too weak, just the right amount of pure maple flavor. Located north of Eau Claire, Andersons has been producing Wisconsin's finest maple syrup for over 80 years. They are one of the largest maple syrup producers in Wisconsin. You won't find a better syrup than this. 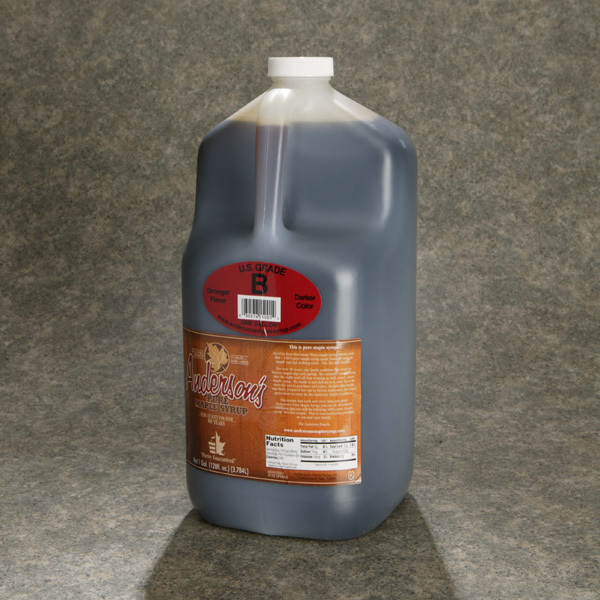 This is a darker colored syrup and has a much stronger flavor than grade A maple syrup. It is best used as a sweetener in cooking and whenever you desire a very strong maple flavor. Located north of Eau Claire, Andersons has been producing Wisconsins finest maple syrup for over 80 years. They are one of the largest maple syrup producers in Wisconsin. You won't find a better syrup than this!